Built environments are the places and spaces in which people live, work, play and learn. When strategically designed, these places including homes, neighbourhoods, schools, streets, workplaces and parks, can reduce obesity and chronic diseases, like heart disease and diabetes, as well as improve the well-being and social connection of residents. Like many other cities around the world, Kelowna is grappling with how to build a vibrant, healthy and sustainable city in the face of challenges including climate change, a growing prevalence of chronic health conditions, and an aging population. The City of Kelowna and Interior Health Authority have partnered to develop the Healthy City Strategy, a long term, integrative plan that focuses on healthy places and spaces, community health, and quality of life for all Kelowna residents. This strategy will promote integrated decision-making and is proposed to be a companion document to the Official Community Plan with implementable actions in six theme areas. 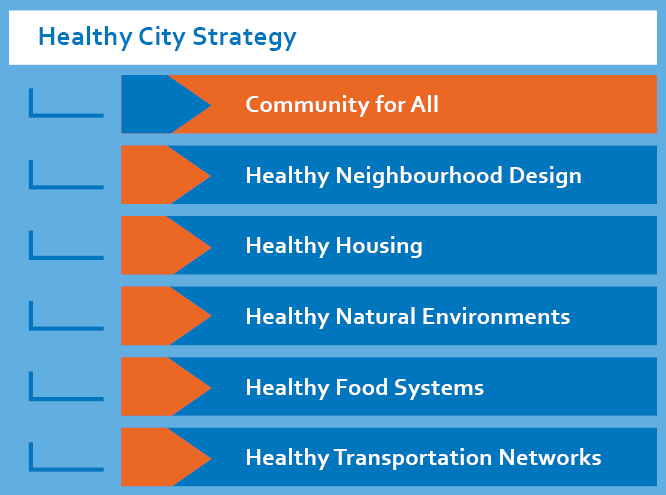 As part of the Healthy City Strategy, City of Kelowna community planners and Interior Health public health practitioners worked together with a focus on the first of six themes areas: a Community for All. Demographic shifts across the globe are having a profound impact on community age relations and Kelowna is no different. The Community for All Plan will identify areas to adapt policies, plans and programs to respond to the evolving needs of our community as actions for healthier seniors will provide co-benefits to children and residents with diverse abilities enabling them to be active and engaged within our community. The broader topic of housing is a community-wide issue that directly impacts people's physical and social health. As part of the Healthy Housing Strategy, City of Kelowna community planners and Interior Health public health practitioners are working together with a focus on the second of six theme areas: Healthy Housing. Healthy Housing will build on the Healthy City Strategy's Community for All Plan in which housing was identified as an issue for seniors, children and those with diverse abilities. A Healthy Housing Strategy will be developed and will include recommendations for the City of Kelowna, Interior Health and select community stakeholders that will guide policies, regulations and programs to achieve healthy housing options that are diverse, affordable and attainable. Content added from related PDF's found on old site. May need revisions.